Pickleweed (Salicornia), an unusual plant that grows in the salt marsh habitat where the Sacramento River meets the Pacific Ocean, provides nearly the sole sustenance for an endangered small rodent known as the salt marsh harvest mouse (Reithrodontomys raviventris). In waters just upstream, splittail minnows (Pogonichthys macrolepidotus) may not seem terribly exciting, but when they’re the sole remaining representative of the genus in the world, they become much more special. Both of these species are challenged by the history of water management and use in the Sacramento watershed, and their struggles are emblematic of the difficulties inherent in managing a complex system like the Sacramento. While the harvest mouse has been listed as an endangered species for several decades despite years of efforts by devoted conservationists, the dwindling splittail remains unprotected. Depending on where you are in the watershed, environmental protection can be either a priority or barely a consideration at all. The consequences of the disparity have serious effects for those who recreate and enjoy the variety of habitats along the Sacramento River and its many tributaries. The Sacramento River watershed is roughly the size of West Virginia, and it includes approximately 17 percent of California's land area. More than 400 miles long, the watershed flows through the Cascades, the Coast Range, the Sierra Nevadas, Modoc Plateau and the Sacramento Valley. The range of ecosystems through this sprawling river system is staggering. In its headwaters, the water pulses icily through steep mountains. Further on, oak woodlands, mixed pine forests, chaparral, and sagebrush culminate in estuaries in the heart of urban San Francisco, while agriculture dominates the landscape in the Sacramento Valley for much of the trip downstream. Farming, flood control, hydroelectric power, drinking water, and recreation form the backbone of the many uses of the watershed. Water from this region is used as far away as San Diego. With a diversity of users and demands, there are no easy solutions to the management challenges faced by the many conservation efforts focused on the watershed. The population is only going to increase in the coming decades while the amount of water will, if anything, decrease. Three rivers combine at Lake Shasta, the 4.5 million acre-foot reservoir created by the Shasta Dam. It is here where the Upper Sacramento, McCloud, and Pit rivers form the Sacramento River. The first major take from the river occurs at Red Bluff, where a significant amount of water is siphoned into canals to provide irrigation water for farms in the Sacramento Valley. Further downstream in the city of Sacramento, the river is essentially divided into two as it is cut into the mainstream and the Sacramento Deep Water Ship Channel (DWSC) built to allow barge traffic up and down the waterway from the Pacific. Sacramento is also where the Feather River and American River, the two largest tributaries to the Sacramento River, join the flow. The DWSC and main river rejoin in the estuary near Rio Vista as they meet the Pacific Ocean. Beyond the regional uses, drought and climate change are having their own effects. As temperatures soar and less water falls, entire forest ecosystems are being ravaged due to drought and ensuing wildfires. 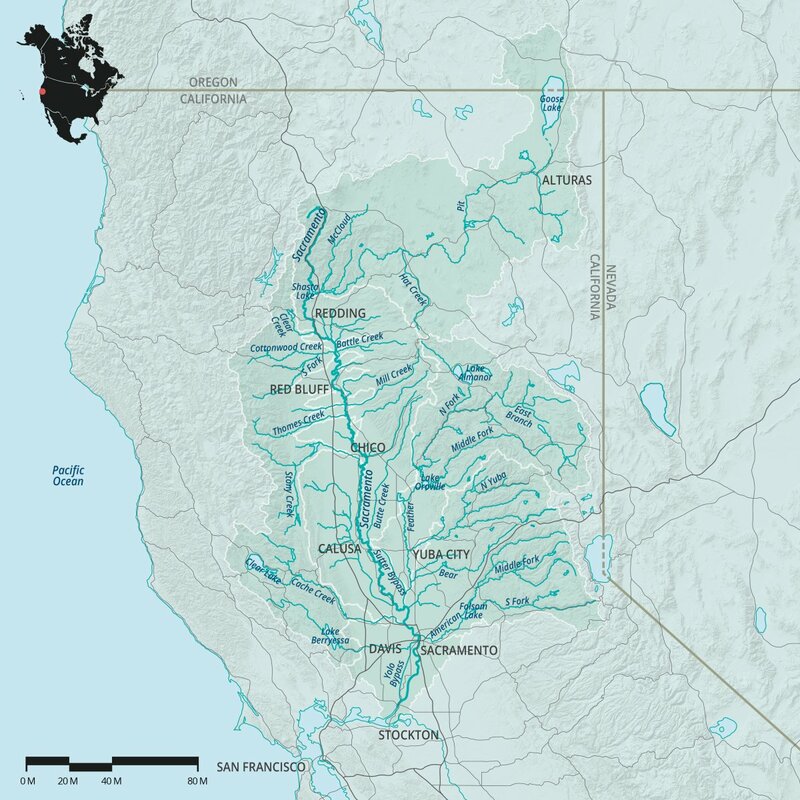 Given the scale of this particular watershed, with the largest inland delta and largest estuary on the West Coast of the Americas, not to mention longest river in California, understanding the complexities is important for those who recreate in northern California. The delta alone pulls in nearly seven million visitors a year for fishing, boating, camping, windsurfing, and other outdoor activities. Twenty endangered species are home to these waters. Down from millions of salmon just 40 years ago, runs now average well below 40,000. The effects of diversion and pollution are just part of the equation in the depleted numbers currently seen. Anadramous fish face difficulty navigating waterways depleted by agricultural diversions and drinking water needs. As wetlands and marshland is reduced, migrating waterfowl see reduced habitat as well. Creatures like the splittail see their numbers trimmed further. How do we prioritize water use? What value do we place on the likes of a tiny minnow in the grand scheme of supporting the agricultural breadbasket of America? Where will clean drinking water come from as drought and climate change continue to put pressure on water usage? In an upcoming series of pieces, I’ll be taking a look at the complex management and conservation issues facing the Sacramento watershed, highlighting the people who live there, their water use, conflicts, and conservation approaches. This series is in an effort to help all who recreate in the waters to better understand the challenges of the region. Examining how species like the harvest mouse or endangered fisheries are being protected and supported by conservation and recreation groups alike will give a broader picture of the needs of the area. There are no simple clear answers, but I hope by the end, the issues at stake are presented and a dialogue is encouraged.